All books are written to be read. Some books are meant to be devoured. 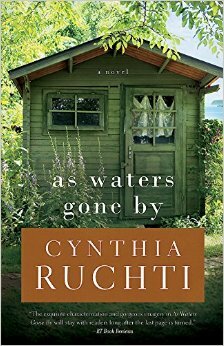 Others like As Waters Gone By by Cynthia Ruchti are meant to be savoured like a delicious dessert or a fine wine. As Waters Gone By is a truly beautiful book, which showers the reader with a feeling of calm and tranquility, and I was blessed to receive a copy. Emmalyn has had her life on hold for four years whilst her husband Max serves a five year prison sentence. For most of that time, they have not communicated. Emmalyn has lost her house, her job, her opportunity to have children and she is desperately clinging to what little hope she has to save her marriage. Emmalyn makes the ferry crossing to Madeline Island as the novel opens, to repair and live in their summer cottage. Her first night on the island is spent in the Wild Iris, where she meets the hospitable owner Bougie. Bougie is a larger than life character with a huge heart for people. In spite of being young enough to be Emmalyn’s daughter, she has the mothering instinct and takes Emmalyn to heart. Bougie gives her just what she needs, as Bougie practices the gift of hospitality. Bougie is also wise beyond her years, and as a Christian she dispenses her words of wisdom and love. As Waters Gone By is a novel about second chances. Max will need some-one to give him a second chance when he is released from prison. It is with this in mind, that Emmalyn also gives people second chances. She does not write them off, and neither does Bougie, who welcomes everyone and judges no-one. The summer cottage is more dilapidated than Emmalyn first thought, due to a recent storm. The cottage can be seen as a motif for Emmalyn’s life – wrecked and in need of fixing. The motif of water runs throughout the novel – calm, stormy, rain, snow – it’s all there washing over the action. For me, I felt the healing power of the water in the novel and an immense sense of calm. The twin themes of grace and God’s love are present in the novel. Everyone deserves grace and it can be seen to be handed out first by Bougie, and then it just snowballs as people practice the art of grace. It is shown to them, and so they pay it forward. God’s love covers the whole novel. Bougie has it in abundance. When Emmalyn first arrives at the island, she feels sad and alone, and far from God. As Emmalyn repairs hers house and gets to know people on the island, so she has the opportunity to know the God she thought had abandoned her. There is a wonderful little dog whom Emmalyn names Comfort that just shows up on her doorstep. The locals know the dog and tell her that he just turns up just where he is needed, stays for a while and then leaves. This reminded me of Jesus’ words to His disciples promising to send them the Holy Spirit to be their comforter. The difference is, the Holy Spirit doesn’t move on and leave us. As Waters Gone By is a very powerful novel that sank deep into my soul. There are wonderful pearls of wisdom to be drawn from it. My absolute favourite was “People know you by your name but call you by your sin. God knows you by your sin but calls you by your name.” I found the whole novel profoundly beautiful and had a deep desire to stay and wallow in its beauty. I did not want it to ever end. I felt that I ‘knew’ the characters and there feels like a gaping hole in my heart now that the novel is finished. If you have never read a novel by Cynthia Ruchti, you are missing out. Please buy or download a copy of As Waters Gone By today, and prepare to immerse yourself in a story, so beautiful that you will never want it to end.